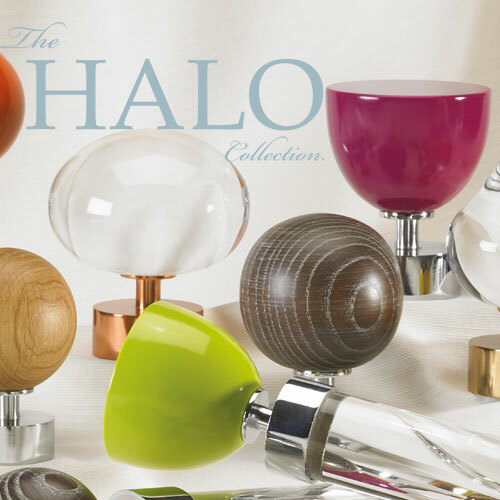 The Halo Acrylic Collection of Curtain Poles from Byron and Byron are a Contemporary range of Acrylic Curtain Poles with contemporary finials; Halo Acrylic, Halo Gloss and Halo Washed Wood. The Original Halo Acrylic collection is a range of clear acrylic poles which can be bought hollow to fill with beads, ribbons or your favourite things to create a unique pole or solid clear for dazzling impact. Halo Gloss is a bold and sleek curtain pole range in 12 rich shades with a high gloss finish. Stretch your imagination with shades such as Lipstick to Azure. Halo Washed Wood offers an organic natural warmth and texture combines with Contemporary designed finials in finishes such as Smoked Oak and Chateau Grey. So choose your Finish and Design, let us know your window size and Contact Us for a quote.